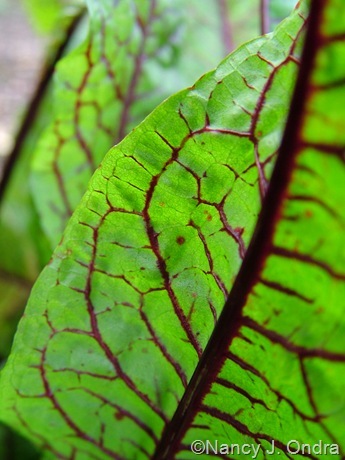 From shocking to sultry, reds add a distinctive feature to the flowers, foliage, and fruits of many plants. There are more names for different shades of red than for many other colors, for a very interesting reason: According to On Being Well Red, the Romans based their color names on the various dyes they could produce, and apparently there were quite a few ways to produce reds. 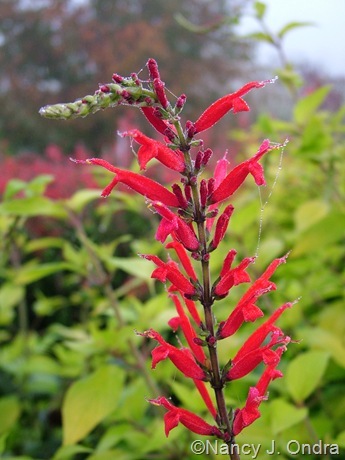 Another basic red is rutilans, as in Salvia rutilans (pineapple sage, which is now technically Salvia elegans ‘Scarlet Pineapple’). You may also see the prefix “erythro-”, as in the genus Erythrina (often called coral trees or flame trees); the red-plumed Amaranthus hybridus var. erythrostachys ; and the red-stemmed Acer pensylvanicum ‘Erythocladum’ (moosewood maple). If you vampire fans can remember that exsanguinate means “to drain (or be drained) of blood,” it’s no trouble to connect sanguineus (-a, -um) to blood-red. 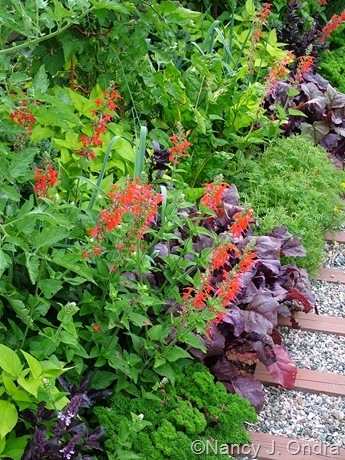 Examples in the plant world include Heuchera sanguinea (coralbells) , Cornus sanguinea (bloodtwig dogwood), Rumex sanguineus (bloody dock), and Geranium sanguineum (bloody cranesbill). Atrosanguineus (-a, -um) refers to an even deeper red, as in the flowers of Cosmos atrosanguineus (chocolate cosmos) and Potentilla atrosanguinea (ruby cinquefoil). Cruentus (-a, -um), too, refers to blood-red. Amaranthus cruentus (red amaranth) is one example. For deeper red, there’s atrococcineus (-a, -um), as in Centranthus ruber ‘Atrococcineus’ (the form of red valerian with darker red flowers). The backstory for the word crimson is complicated, but if I’ve figured it out right, it has to do with the dye made from a scale insect (Kermes vermilio). 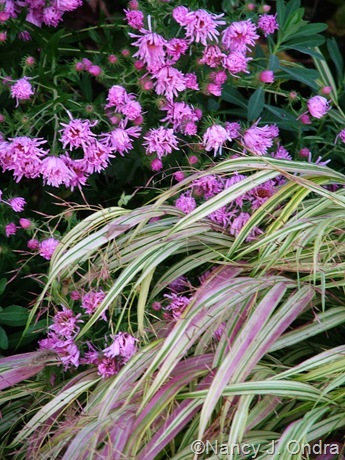 In plant names, we have carmineus (-a, -um), carminatus (-a, -um), and kermesinus (-a, -um), as in Deutzia x rosea ‘Carminea’ (pink deutzia) and Clematis ‘Kermesina’. The Latin miniatus (-a, -um), from minium, referring to the pigments red lead or vermilion (ground-up cinnabar), appears most recognizably in Clivia miniata (kaffir lily). 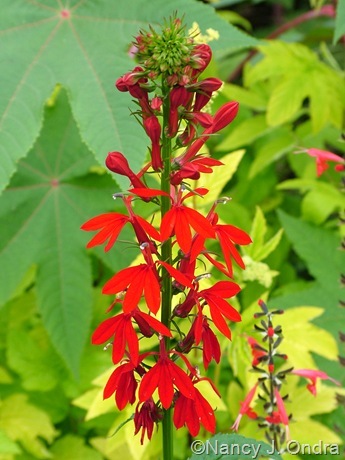 I hardly need to explain cardinalis or cardinale, as in Lobelia cardinalis (cardinal flower). Fiery reds are indicated by flammeus (-a, -um) and igneus (-a, -um), as in Rhododendron flammeum (Oconee azalea) and Cuphea ignea (cigar or firecracker plant). For rosy reds, there’s good old roseus (-a, -um): think of Coreopsis rosea (pink tickseed), Catharanthus roseus (rosy periwinkle), and Rhododendron ‘Roseum Elegans’, to name just a few examples. When you drift towards flesh-pink, there’s carneus (-a, -um) and incarnatus (-a, -um), as in the words carnal (of the flesh or body) and incarnate (in the flesh). 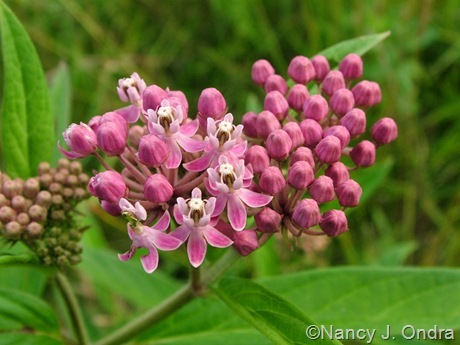 In the plant world, it refers to the flower colors of Aesculus x carnea (red horsechestnut), Erica carnea (winter or spring heath), and Asclepias incarnata (swamp milkweed). As reds get mixed with a bit more yellow, colors start drifting into the orange range. This is also a good place to cover rusty and coppery colors. Reddish brown colors are indicated by rubiginosus (-a, -um) and the prefix “rufi-”: examples include Ficus rubiginosa (rusty fig, with reddish brown leaf undersides) and Acer rufinerve (redvein maple). 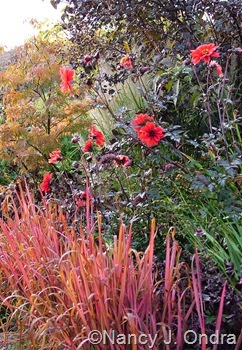 For brick-related colors, there’s lateritius (-a, -um) and testaceus (-a, -um), as in Papaver lateritium (Armenian poppy, which is distinctly orange in bloom) and Carex testacea (orange New Zealand sedge, with orangey brown foliage). 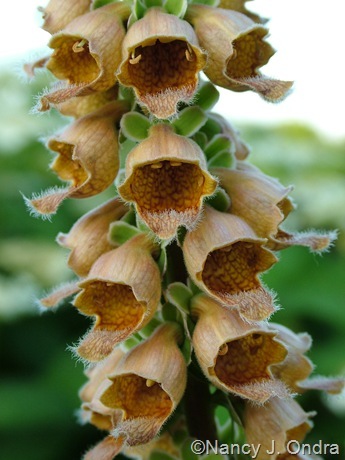 Ferrum, the Latin word for iron, appears in ferrugineus (-a, -um): think of Digitalis ferruginea (rusty foxglove). It makes sense that cupreus (-a, -um) would indicate coppery colors. 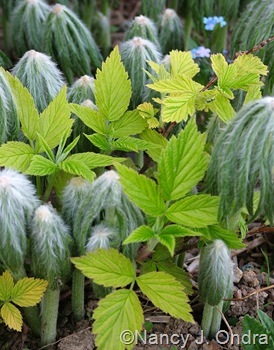 The most obvious example is the Fagus sylvatica Cuprea Group (copper beeches). “Tawny” colors – anywhere in the range of brownish to reddish yellows (essentially, shades of orange) – are indicated by fulvus (-a, -um). 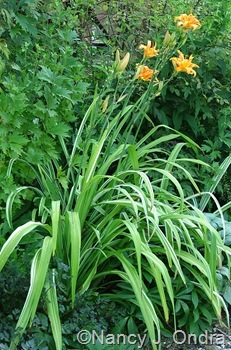 Hemerocallis fulva (commonly known as tawny daylily or ditch lily) is one well-known example; Iris fulva (copper iris) is another. 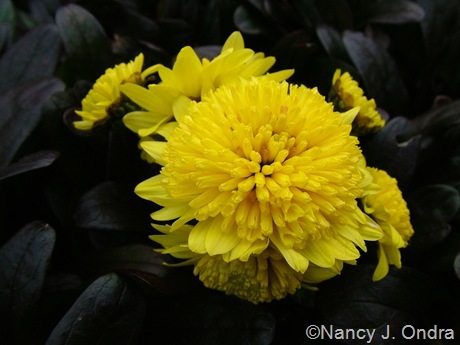 If you’ve ever grown calendulas or pot marigolds (Calendula officinalis), it’s no stretch to remember that calendulaceus (-a, -um) refers to shades of calendula orange or flame colors, as in Rhododendron calendulaceum (flame azalea). 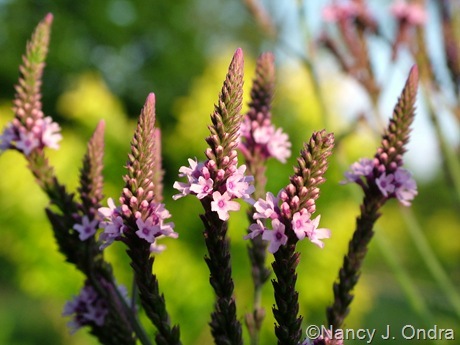 And for a basic orange, there’s aurantiacus (-a, -um): Agastache aurantiaca (orange hummingbird mint), Hieracium aurantiacum (orange hawkweed), and Ilex verticillata var. 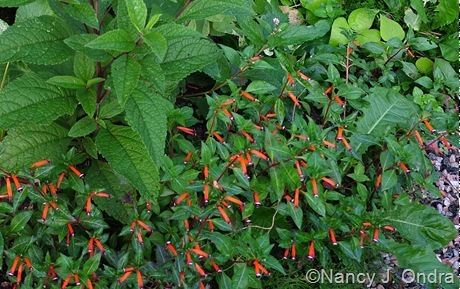 aurantiaca (orange winterberry holly) are just a few examples. 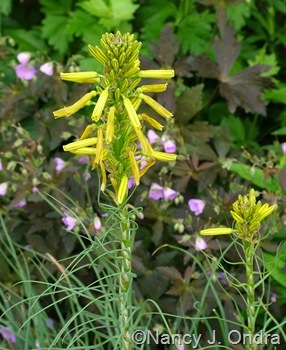 Yellow-related terms pop up a lot in plant names, most often in connection with flower colors or markings by sometimes in the leaves, bark, or even roots. If you spend any time at all looking at plant names, you’ve seen aureus, aurea, and aureum (referring to gold), especially in relation to foliage. 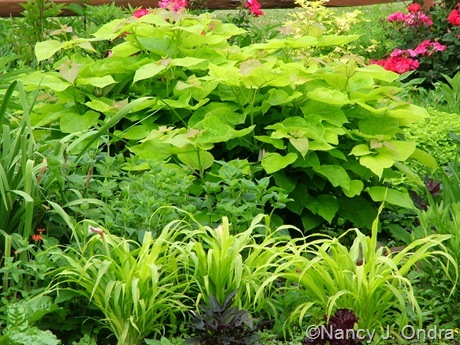 Examples here include Catalpa bignonioides ‘Aurea’ (golden catalpa), Humulus lupulus ‘Aureus’ (golden hops), and Origanum vulgare ‘Aureum’ (golden oregano). The closely related aureolus (-a, -um) doesn’t appear nearly as frequently, but it’s familiar to many gardeners in Hakonechloa macra ‘Aureola’ (golden Hakone grass). Auratus (-a, -um) also fits in this group: you see it in Lilium auratum (gold band or golden-rayed lily). 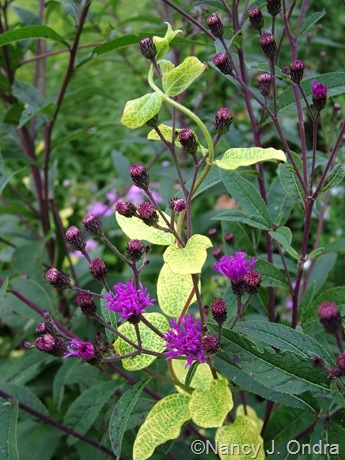 The prefix “aureo-” belongs here too, and it appears in a good many names, including Phyllostachya aureosulcata (yellow-groove bamboo) and Lonicera japonica ‘Aureoreticulata’ (goldnet honeysuckle), to give just two examples. Another group of terms that often appear in yellow-related names includes flavus, flava, and flavum, as well as flavulus (-a, -um), flavens, flavescens and the prefix “flavo-”. 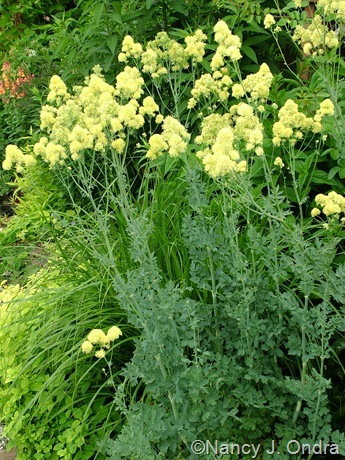 A few examples include Thalictrum flavum subsp. glaucum (dusty yellow meadowrue) and Hosta tokudama f. flavocircinalis (a hosta with yellow-edged leaves). The citrus fruit known as citron (Citrus medica) has a greenish yellow rind, and it gives its name to a greenish yellow or lemon-yellow color as citrinus, citrina, and citrinum, most obviously in Hemerocallis citrina (citron daylily). Crocus and crocum, for saffron, give us croceus, crocea, and croceum, as in the rich yellow Iceland poppy Papaver nudicaule var. croceum. No need to explain the connection between sulphureus/sulfureus (-a, -um) and sulfur-yellow, as in Hedera hibernica ‘Sulphurea’ and Epimedium x versicolor ‘Sulphureum’. 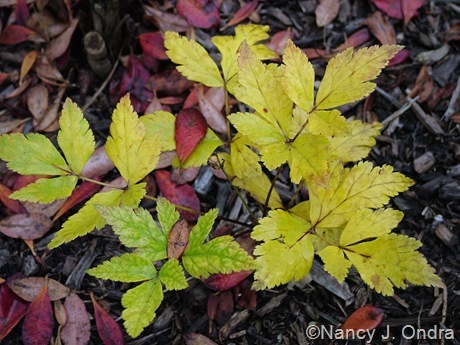 And one more for the yellows: the prefix “xantho-”, as in Xanthorhiza simplicissima (yellowroot), which does have yellow roots as well as great yellow fall color. For the rest of the rainbow, plus some bonus color-related terms, click over to Through the Rainbow Part II.